Mon., Oct. 30, 2017, 6 a.m.
DALLAS – Murky water started seeping into a Port Arthur, Texas, nursing home four days after administrators decided to shelter in place. Volunteers – one even brandishing a gun – demanded relocation of the elderly residents, at least two of whom died in the days after police ultimately ordered the evacuation. The deaths of elderly residents at Lake Arthur Place and other Texas and Florida facilities after hurricanes made landfall in August and September have heightened scrutiny of the evacuation procedures at nursing homes and assisted living facilities. “A lot of things went wrong, and went very tragically wrong,” said Chip Ferguson, a lawyer representing families who have filed civil lawsuits against two Port Arthur nursing homes. It’s difficult for investigators to determine whether decisions on when to evacuate played a role in the deaths. That’s partly because many older residents at the facilities have underlying medical conditions, and local emergency officials use different criteria to decide whether to categorize a death as storm-related. Thirteen residents of a Hollywood, Florida, nursing home that sheltered residents in place during Hurricane Irma died in the weeks after the storm left the overheated facility without power for air conditioning for days. A man being evacuated from a Friendswood, Texas, nursing home facility during Hurricane Harvey was found dead on a charter bus. And another man died in a Corpus Christi, Texas, nursing home that decided to shelter in place during Harvey, although the county medical examiner’s office said it was not called to investigate that death as being storm-related. The Texas Health Care Association, which represents long-term health care providers, including the state’s nursing homes, said about 4,000 patients in more than 160 nursing home and assisted living facilities were evacuated either before Harvey made landfall or during the intense rain and flooding in the days after. 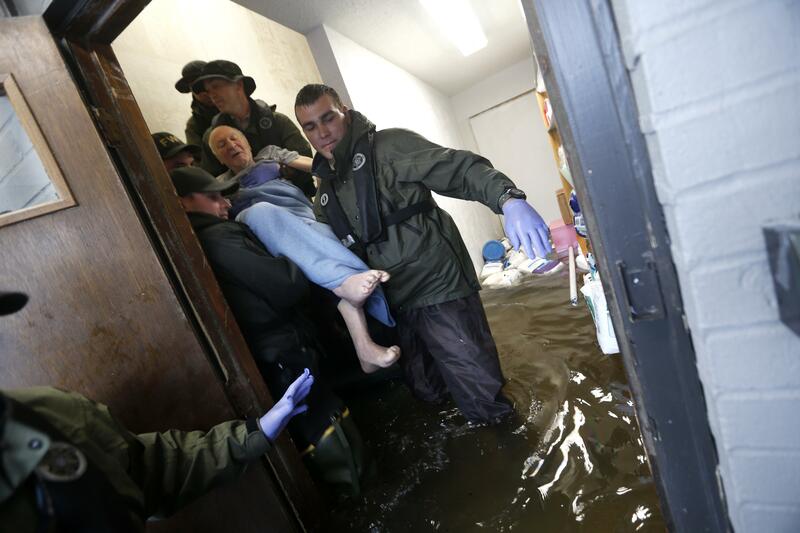 Nearly 33,000 patients in hundreds of other facilities sheltered in place. “A greater emphasis has been placed on sheltering in place in recent years, given the challenges and issues that can go with evacuations of this population,” said Kevin Warren, the chief executive officer and president of the association. Kathryn Hyer, the director of the University of South Florida’s Center on Aging, said a study she co-authored found that nursing home patients who were evacuated during a hurricane had a 3 to 5 percent higher chance of dying within 90 days than those who stayed put and an 8 percent higher chance of being hospitalized. She also said hurricanes can change their forecast tracks, which poses another danger in evacuating. As Irma neared Florida, some nursing homes on the Atlantic coast moved their patients 100 miles or more to the Gulf Coast, only to have the storm’s track also move west, forcing a retreat. “You shelter in place until you can’t shelter in place,” Hyer said. Until the evening of Aug. 29, when the swirling, rain-swollen remnants of Harvey shifted, sheltering in place seemed like the right decision for the two Port Arthur nursing homes owned by Dallas-based Senior Care Centers. Then 26 inches of water fell and started seeping into the homes. The company’s official statement said once water started entering the facilities, on-site administrators called for help. By that time, county emergency personnel were overwhelmed with similar calls for help. Members of the Cajun Navy, a group of volunteers with private boats mostly from Louisiana, began offering help to water-logged residents. But Lake Arthur Place staff declined the offer, concerned about releasing frail residents to volunteers without medical training. Statements to Port Arthur police and reports by officers who responded paint a picture of desperate events. A member of the Cajun Navy allegedly pulled a gun during an argument, demanding access to patients. Police were called, and an administrator was handcuffed as he tried to block officers from taking patients because he feared they weren’t really police. Since then, police have seized records and communication as part of a criminal investigation into whether the evacuation delay endangered the elderly residents. Families of several residents also have filed formal complaints and lawsuits against the facility alleging mistreatment of residents. Christine Mann, a spokeswoman for Texas’ Health and Human Services Commission, said 90 Harvey-related complaints were filed against 53 nursing homes, assisted living facilities and other long-term care centers between Aug. 25 and Oct. 9. She said the agency will investigate each of the Harvey-related claims, the vast majority of which involved allegations of patient neglect. Florida regulators took swift action against the Hollywood nursing home, suspending the facility’s license and launching an investigation into why the 150 patients weren’t evacuated to an air-conditioned hospital across the street until after the first deaths occurred. Gov. Rick Scott issued an executive order requiring nursing homes to install generators that can power air conditioners, but nursing homes are challenging that order in court. So far, no one in either state has been criminally charged over the incidents. Darrell Pile, chief executive officer of the Southeast Texas Regional Advisory Council, oversees the coordinated trauma care and medical response teams in a 25-county area of Southeast Texas during disasters. He said some of the issues with knowing when and if to evacuate during Harvey came because no one could predict the record-breaking amount of rain dumped in the span of a few days. Pile’s staff made calls in advance asking each facility if they would shelter or evacuate. In the end, his group helped organize emergency medical evacuations at 20 nursing home and elder care facilities, not including facilities like Lake Arthur where volunteers evacuated residents. “There were a few instances where a better decision should have been made,” Pile said. Ferguson said the residents were taken in small boats to a vehicle that could transport them on the flooded roads to the evacuation shelter. From there, many were flown by helicopter or driven to other facilities to handle medical needs. “That would be traumatic for a healthy, younger person, but even more so for this population,” Ferguson said. Published: Oct. 30, 2017, 6 a.m.